For seven days in the Fall of 2012, Hurricane Sandy pounded the Caribbean and US East Coast with punishing rain, wind, and waves. As the storm approached landfall, the National Hurricane Center renamed the hurricane "Post-Tropical Cyclone Sandy." But to those whose lives were devastated – it will always be remembered as super storm Sandy. What happened in the atmosphere that caused this monstrous storm to form? Summer and winter weather conditions collided with extreme forces. The primary difference between a tropical cyclone, also called a hurricane, and a wintertime cyclone is the energy source. Tropical cyclones extract heat from the ocean and grow by releasing that heat in the atmosphere near the storm center. Wintertime storms, on the other hand, get most of their energy from temperature contrasts in the atmosphere, and this energy usually gets distributed over larger areas. Sandy started out as a classic hurricane, getting energy from the warm waters of the Caribbean and moving northward along the Gulf Stream. Sandy then took a sharp left turn into the New Jersey and New York coasts and collided with a winter-like storm system. 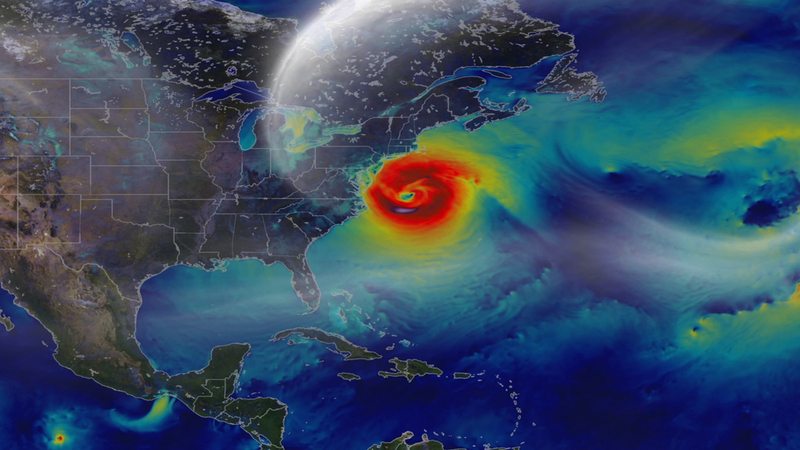 As Sandy’s energy source transitioned from the warm ocean water to the atmosphere it morphed into a wintertime cyclone and dramatically increased in size. High winds extended 1,000 miles across bringing record-breaking storm surges to coastal areas and blizzard conditions to the mountains. Tunnels turned into rivers and parking lots into ponds. Residents returned to find their belongings floating in pools of water in their homes and yards. Cars were pushed around like toys and mountains of sands filled the streets. Power outages lasted for days, weeks, and in some places for months. One neighborhood even burned to the ground. Initial calculations for damages were $50 billion. As cities and towns rebuild that number continues to rise. Sandy is a heartbreaking reminder that the end of summer isn’t the end of hurricane season. Hurricane season runs from June 1 to November 30 with the peak of the season from mid-August to late October. Put together an emergency plan and supply kit now, so you are prepared for extreme weather no matter when it strikes. Sandy, as a hurricane and a post-tropical cyclone, killed at least 117 people in the United States and 69 more in Canada and the Caribbean. Sandy ranks as the second-costliest storm on record at $68 billion. Hurricane Katrina of 2005 is the highest at $108 billion. The New York Stock Exchange closed for two consecutive days, the first time this has happened because of weather since 1888. At its peak intensity, Hurricane Sandy measured a Category 3 as it made landfall in Cuba. Sandy was the 18th named storm, 10th hurricane, and second major hurricane of 2012.